KIEV, Ukraine -- Ukrainians vote Sunday in local elections that are viewed as a test of President Viktor Yanukovych's commitment to democracy. Already his critics are crying foul. Opposition leader Yulia Tymoshenko (L), at a protest in Kiev in early October. Opposition leaders have accused the government of printing fake ballots and pressuring their candidates not to run. Opora, a nonpartisan observer group, said some doctors, teachers and other state employees had been threatened with dismissal if they ran against Mr. Yanukovych's Party of Regions for mayor and municipal council seats across Ukraine. Yulia Tymoshenko, the chief opposition leader, said she wouldn't recognize results in three of the country's 24 regions because the authorities there have registered defectors from her party as candidates while, she says, refusing to allow her genuine supporters to run. U.S. Vice President Joseph Biden spoke to Mr. Yanukovych by telephone this month to stress the importance of a free and fair election in the former Soviet republic. About 500 American and European observers, along with hundreds from Ukraine, are to monitor the voting and ballot counting in 15,000 localities. Mr. Yanukovych has pledged to ensure fairness. "These are my first elections as president of Ukraine, and there's no one more interested in their proceeding democratically and honestly," he told journalists. Any interference by government officials, he added, is "inadmissible." He rejected Ms. Tymoshenko's accusations, saying her party was "attempting to blame someone else" for its internal divisions. Democratic elections appeared to take root in Ukraine during the Orange Revolution of 2004, when hundreds of thousands of street protesters forced the annulment of an allegedly fraudulent presidential vote in which Mr. Yanukovych, openly backed by Russia, had been declared the winner. Mr. Yanukovych lost the repeat vote to a pro-Western candidate. He made a comeback in February this year, winning the presidency over Ms. Tymoshenko after years of squabbling between her and other Orange Revolution leaders hamstrung their government programs. The February vote, although contested by Ms. Tymoshenko, was widely judged to be fair. But Mr. Yanukovych's critics say he is trying to re-impose authoritarian rule—by sending security forces to investigate civil society groups, limiting press freedom and moving to strengthen presidential powers. "This campaign has been much less competitive and transparent than the presidential election," said Olha Aivazovska, head of Opora. "We haven't seen such an uneven playing field at all levels since 2004." Local elections were supposed to take place in May but were postponed for lack of financing because parliament had not yet passed the annual budget. During the summer Mr. Yanukovych's ruling coalition pushed through a new electoral law that gave its pro-presidential constituent parties a dominant role on local election commissions. An opinion poll conducted this month by the Democratic Initiatives Foundation said 30% of voters across the country intended to cast ballots for Mr. Yanukovych's party, compared to 12% for Ms. Tymoshenko's party. That could translate into gains for Mr. Yanukovych's supporters in municipalities across the country, even if the electorate remains geographically divided. 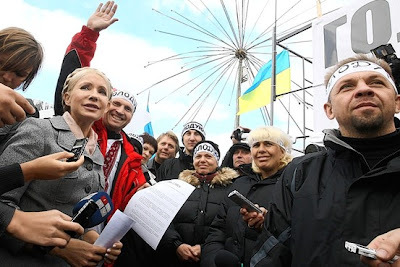 The president's supporters are stronger in the south and east, while Ms. Tymoshenko's are stronger in the west.